Since she came to Wooster, there hasn’t been much Anita Jorney Gifford hasn’t done in the Wooster City Schools system. She began as a teacher, then got into administration, serving first as principal at Edgewood Middle School, then taking over her current position as principal at Wooster High. She might also be called Wooster’s biggest booster — it’s not unusual to find her hawking programs or popcorn at WHS sporting events, and her familiar “Go Woo!” cheer echoes across fields or gymnasiums whenever the Generals are in action. Athletics have always played a big role in Jorney Gifford’s life, starting with her days as a high school athlete at Alliance, where she is a member of that school’s Hall of Fame. 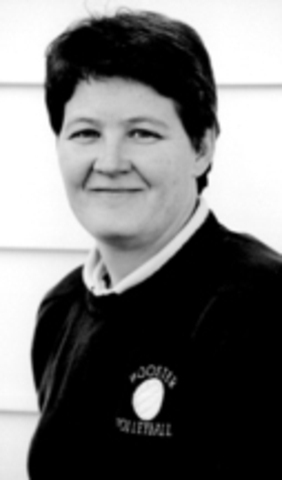 At Wooster High, Jorney Gifford was a head coach in softball and an assistant in track, but made her biggest impact while leading the Generals’ volleyball program for a dozen seasons, during which her teams compiled a record of 243-64. Over that span, Wooster didn’t just win in the Federal League, it dominated. The Generals captured eight Federal League championships, and had an incredible FL winning streak of 78 consecutive matches. Her teams’ successes didn’t stop in the regular season, however. Under Jorney Gifford, Wooster won the sectional championship all 12 times, and in eight of those seasons went on to win the district title as well. Three times, the Generals were district runners-up. seasons from 1993-96. The Generals’ best finish at state was in 1994, when they lost in the title match to place second. Individually, Jorney Gifford was named Ohio Div. I Coach of the Year on two occasions, was District IV Coach of the Year seven times and an eight-time Federal League Coach of the Year. She was a coach in the state All-Star match in 1995 and received the Ohio High School Volleyball Coaches Association Award four times. Her induction into the Wayne County Sports Hall of Fame is her fourth such honor. In addition to the Alliance High HOF, she was previously inducted into the Ohio High School Volleyball Coaches Association Hall of Fame in 2000 and the Wooster High All-Sports Hall of Fame in 2007.